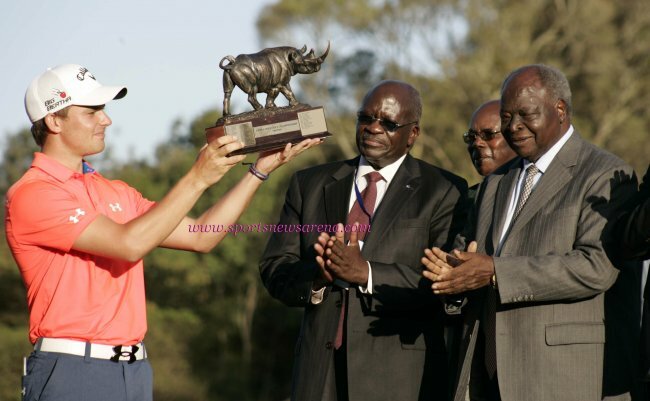 Haydn Porteous carded a dramatic eagle two at the first extra hole to edge out compatriot and friend Brandon Stone en route to his first professional title at the Barclays Kenya Open. Dimsas Indiza Anyonyi finished the event as top Kenyan, despite a 75 on Sunday that saw him drop back into a share of 28th, having entered the final round in the top ten. The 20 year old South African from Johannesburg hit a sublime three wood from the tee to seven feet at the par four 12th in the first hole of sudden death after signing for a closing 68 at Karen Country Club to pull alongside Stone at 17 under par, having trailed by one overnight. In what was a ding-dong battle between the final group, Porteous made a strong start with two birdies before further gains followed at the fifth, 12th and 13th to cover dropped shots at the sixth and 14th. As for Stone, who made six birdies of his own on Sunday to card a 69, the turning point came when he racked up a double bogey at the par four 13th. That allowed Porteous back into contention, and when the pair both birdied the par five 18th, extra holes were required to decide a victor. The triumph fulfils the promise Porteous showed as an amateur, while it also earns him a first full season of Challenge Tour action. “It hasn’t sunk in just yet, but I am sure when I wake up tomorrow morning I will know exactly what I’ve done,” said Porteous, who was ranked the best amateur in South Africa before joining the paid ranks. “It was nerve-wracking out there today and certainly not boring. “Brandon was two shots ahead, then I was two shots ahead, then we were even down the last and ended up both making clutch putts for birdie before the play-off. Then it was a once in a lifetime eagle. “It was a great way to finish it, and this is what I was playing for, to win and get an exemption on the Challenge Tour. Hopefully if I have a good season now I will get a European Tour card, so to win was unbelievable. “I handled the pressure okay, apart from on the greens where I struggled a little with the nerves, but apart from that I kept the ball in play and did all the other things I needed to do to keep myself in it. “It is not ideal to have to beat one of your compatriots, but at the end of the day there has to be a winner, and unfortunately for him he was runner-up. The South African pair may have taken much of the attention on the final day in Kenya, but there was plenty of exemplary play elsewhere in the closing 18 holes, not least from George Woolgar who signed for a 67 to finish one stroke back in third - the best performance of the Englishman's career so far. Another Englishman, Sam Walker, was another shot back in fourth after the three-time Challenge Tour winner posted a 69 to close.